Choosing a webinar provider is an extensive task to undertake that requires weeks of research, hard work, and patience. There's no "one size fits all" formula for every event, so finding the right webinar platform to produce your content has to fall perfectly in place. Are you a DIY or Fully Serviced Webinar Platform? Different vendors have different ways of doing things; some allow you to handle every detail yourself (DIY) while others provide you with a team that organizes the event from start to finish (Full Service). If your event is small and casual, you may be able to accomplish everything you need with a DIY vendor. But if you're drawing in a larger audience and a certain level of professionalism is required, you definitely want to partner with a full service platform. It's important to discuss this early on with your prospective vendors because they might offer the features you need, just not the level of service desired, and you can find out too late if this question is not thoroughly discussed. Can you build an integrated registration page complete with branding, e-commerce capabilities and auto confirmation emails? This sounds like three different questions, I know. But the reason why we can group them all together is because it essentially asks the provider, how much customization do you allow? Being able to brand your registration page is important because it elicits professionalism and trust (as opposed to sending attendees to a third party page where its unclear who they're giving their information to). Having an e-commerce option in your registration may be something you may or may not need for your event, but should definitely be offered in case you do need to charge for the event. Auto confirmation emails are a no-brainer; you want your attendees to receive a confirmation email after they register confirming their entry. Not only will this clarify any confusion during registration, but it will also serve as a resource when they're looking for the link to access your web room (assuming you don't already send reminder emails -which you absolutely should). 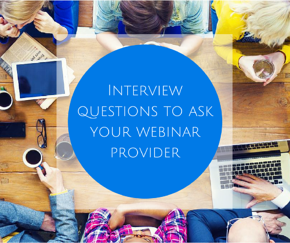 Can you record the webinar for future viewing and can you host it OnDemand? Having a recording of your webinar is as great of an asset as the live event itself. By offering access to your webinar recording you will increase the life span of your webinar while earning new registrants you can enter into your marketing funnel. If you don't have the ability to host the recording on your website (while collecting the necessary information), you will definitely need your webinar provider to offer you an OnDemand option that matches your website and accomplishes everything you need it to. Does your platform meets the requirements of the continuing education industry? If your webinar aims to provide continuing education credits to your attendees, you will need a provider that can help you obtain the right accreditation and that has a platform that meets all of your jurisdiction's requirements. This should be discussed very early on. Do you provide detailed reporting of the event? It would be pointless to spend so much time and effort delivering a webinar and not gather information on its performance. Its important to know the number of registrants, the amount of people who actually showed up, and what the feedback was so that you can make any necessary changes to your future events. What will you do if i have a technical issue during my live presentation? Most DIY webinar providers don't have a real contingency plan in place in the event of an emergency. Most do have a support line you can call but by the time you talk to someone who can resolve your issue, you will have lost most of your audience. That's where having a Full Service provider shines the most; you have a dedicated moderator by your side through out your whole event. This person is trained to jump in and take control of the situation, minimizing the wait time your attendees may experience, resulting in a much more seamless experience. Ask yourself, can I afford to have such an issue interrupt my event for longer than a few minutes? If the answer is no, consider a full service provider. Will attendees be required to download software to enter the web room? This situation will be the 'make it or break it' moment for many of your attendees: if your webinar requires a download and they go through with it anyways, they're truly interested. But if they find the download too inconvenient, they will give up right away and never make it to your web room. Don't risk losing half of your audience because your provider is still using software from the past. : Having a browser-based webinar platform is a major part of delivering a memorable user experience. Whoever you decide to go with at the end should meet all of these basic industry standards to deliver the webinar experience you deserve. however, It never hurts to go beyond what your attendees expect.